THE COOL WAY TO WORK ! THERE IS NO NEED FOR ICE PACKS OR FREEZING !! WE HAVE A STRATEGIC SOLUTION WITH AN INNOVATIVE PRODUCT !! 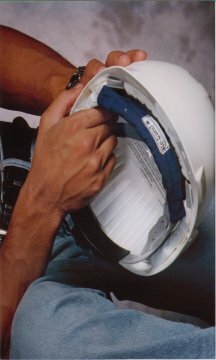 The use of Re-band vests, neck bands, beanies, caps, and hard hat coolers in high heat conditions reduce heat stress by keeping radiant heat from entering the body. Thus reducing heat build up from the inside and prolonging heat stress start up times. If we can cool the blood flow back to the heart by cooling the head, neck, and upper chest area this prolongs heat build up and reduces heat stress symptoms, fatigue, headache, heat stroke. Re-Band becomes a tool for the working man to use when the heat is on, job presures are a lot easier to cope with when your not under heat stress conditions. Each of these products contain cooling agents that once activated (by submerssing in cool water for 5-15 minutes)expand and retain water which evaporates over a 3-5 days. Once this product loses it's cool simply re-activate in water. NO FREEZING, NO COOL PACKS! We have testimonials from our satisfisfied customers, Crestbrook Forest Industries, Consumers Glass, United States Army. We also have MSDS reports as our products are also available in fire retardent material and high visibility. LOW COST, GOOD QUALITY ! IF YOU WOULD LIKE MORE INFORMATION CONTACT US WE WOULD BE HAPPY TO ANSWER ANY QUESTIONS. PLEASE CONTACT US IF YOU ARE INTERESTED IN BECOMING A DISTRIBUTOR WE OFFER DISCOUNT PRICES ON QUANTITY ORDERS. HARD HAT COOLER.. Attaches to the hard hat harness and covers the forehead. 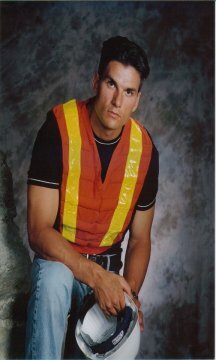 Reduces perspiration and provides a comfortable cushion between your head and hard hat. Available in 8 colors and is made from 65/35% poly/cotton. NECK BAND... Worn around the neck and fastened with velcro,with double channels of cooling. They are available in 8 colors, and made from 65/35% poly/cotton.